Enjoying a few cups of good coffee every morning is very important to me because it is one of my culinary passions. One of the best places to purchase premium coffee is from the Coffee Beanery which has been roasting their beans since 1976! I normally drink regular coffee in the morning and would love to enjoy another cup in the late afternoon or after dinner however the caffeine keeps me awake at night. I have avoided decaf coffees in the past because I have been very concerned about the potentially dangerous chemicals like methylene chloride and ethyl acetate used by most companies in order to remove much of the caffeine from the bean. Therefore, I was very interested to learn that the Coffee Beanery has an entire collection of decaf coffees which are decaffeinated using the Swiss Water Process. I learned that this method of removing the caffeine is done without using any harsh chemicals. Instead, Coffee Beanery sends their 100% Arabica coffee to the Swiss Water Process plant in British Columbia, Canada. There, the premium green coffee beans are water processed in order to maintain the flavor and origin of the bean and then it is roasted fresh on site to order at the Coffee Beanery in Flushing, Michigan. Instead of the typical 93% caffeine free of the standard chemical removal, this water processing method removes a whopping 99.9% of the caffeine! So, how does this decaffeinated coffee taste? I was surprised with the flavor of the decaffeinated coffees that I sampled from the Coffee Beanery. Each of the decaf flavors was complex, flavorful and wonderfully fresh. 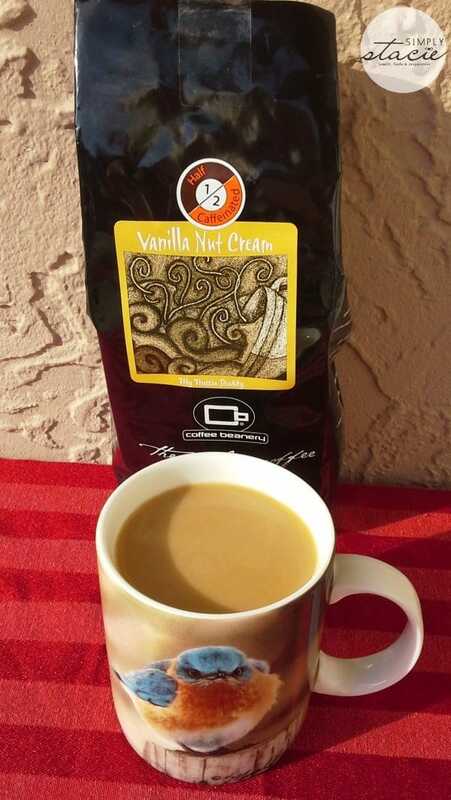 My favorite new coffee to enjoy in the afternoon is the Vanilla Nut Cream ½ Caffeinated Coffee ($14.49 per pound) which is available in whole bean, ground auto-drip (my favorite), fine espresso and more. Immediately upon opening the sealed bag, the fresh aroma of the coffee beans and sweet almonds and vanilla is intoxicating. This coffee tastes as good as it smells and even my husband (who shuns decaffeinated coffee) thought it tasted great and didn’t even realize that half of the caffeine had been removed. I am trying to avoid excess sugar so when I am craving a sweet treat in the evening, I brew a cup of the French Toast Decaf Flavored Coffee ($15.99/$8.49 for a one pound or ½ pound bag) and it really satisfies my sweet tooth with the decadent taste of authentic French Toast without all the extra calories. Whether you enjoy decaf, regular or flavored coffee, you are sure to find the perfect match at Coffee Beanery. There are over 40 different flavors to choose from in a variety of different grinds. 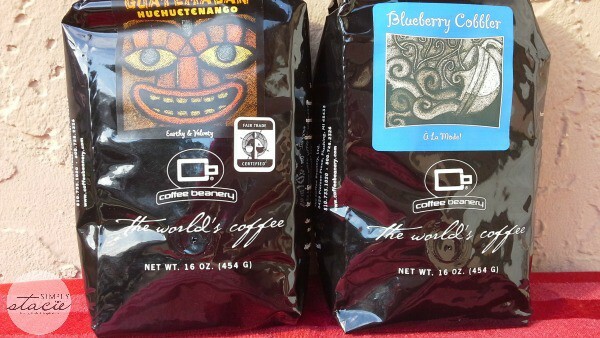 A few of my favorites in the morning include the Blueberry Cobbler Coffee in a regular ground auto-drip and the rich, earthy notes in the sensational Guatemalan Huehuetenango Fair Trade Coffee ($15.99 per one pound bag) which is certified organic! You are invited to visit the Coffee Beanery to purchase all of the coffees mentioned in this review or select your own favorites from among all of the delicious choices. I would like to try the Peruvian Fair Trade Coffee. It’s a limited edition. I would like to try the Ghirardelli Chocolate Sauce. I’d love to try the Peruvian Fair Trade Coffee. Thanks for hosting! I would like to try the Ghirardelli White Chocolate Sauce!!!! I would love to try the Ghirardelli Chocolate Sauce. I would like to try the Chocolate Mint Kiss!! I would like to try the Treasure Chest of Coffee and the Capresso Black Infinity Conical Burr Grinder. I would love to try the Caramel Apple Flavored Coffee. Butter rum, that sounds absolutely delicious. I love butterscotch. The Ghirardelli White Chocolate Sauce!!!! I would love to try the Butter Rum Flavored Coffee. I would love to try the Banana Nut Cream Decaf Flavored Coffee. That sounds absolutely delicious. caramel apple coffee sounds awesome! Banana Nut Creme flavored coffee sounds great! I would love to try their Ghiradelli Chocolate Sauce! Ghirardelli Caramel Sauce would be tasty!